This first entry in the extremely popular and revolutionary fighting-game series was released in 1993. 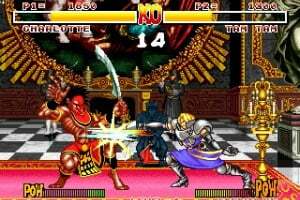 Choose from 12 swordsmen with highly individualistic characteristics and fight furiously, ultimately confronting the evil Amakusa Shiro Tokisada. Each character wields his or her own specific weapon, but you must be careful not to lose it during the heat of battle. Some of the fighters also bring an animal companion into the fray, offering a unique aspect to the quick-paced action. I am surprised they are releasing this on Virtual Console and also an Anthology compilation title for the Wii. You'd think it would be one or the other. Games with TOO MUCH BLOOD are overexaggerative. 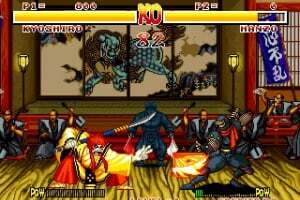 Its too bad, Samurai Shodown would've be an awesome game. 2/5 from me. The Last Blade is better in all basic fighting game aspects BTW. 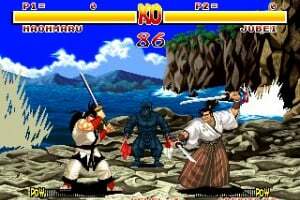 samurai shodown is a classic!arcade emulated,awesome!i want more of these in the vc,10x! I like the look of this game, maybe I'll get it , I'll decide when it's out. Too much blood? The ending fatal spray is one of the most satisfying things about this game. And if you hit right spot in real life, that spray is an eerily real thing. 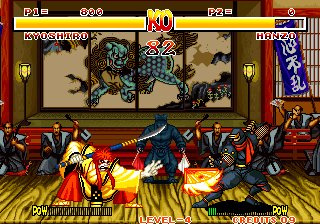 I remember playing this game in the arcade machine at a video store for hours when I was in grade 2 ('93)...I fell in love with it. Since then I've only played crappy console ports. This is an instant must-buy fighter. dejavu game...sob...cry...watered eyes...1993 good moments in university arcade. damo,is this the no blood version?i dont care if the answer is yes...just curious. If they decide to release the US version on the VC, sadly it will be bloodless. Anyway, one of the best beat'em up of all time, and a true classic. Brilliant! Stay away from Fatal Fury 1 or Art Of Fighting and wait for this one! Yeah, this is a great beat'em up. 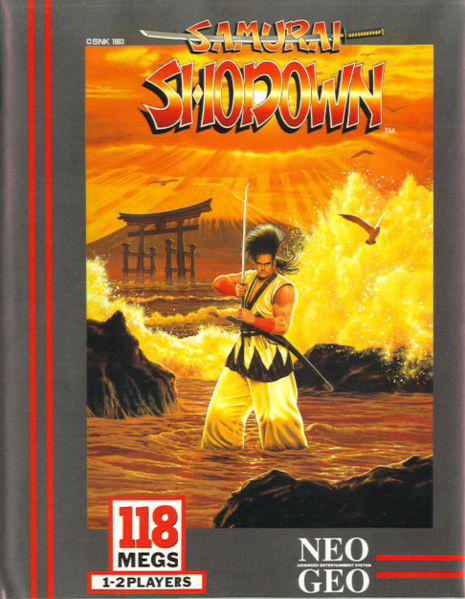 I have a port of Samurai Shodown on Super Game Boy. Yeah it's completely watered down but still was a good game. some great ambient tunes and spot on controls. There's also a good variety of cool fighters to choose from. I'm just saying it has it's own style. I loved this game. I'm thinking about getting this real version. 4 Stars - Because this is one of the best beat'em up series ever. But it's just the beginning. 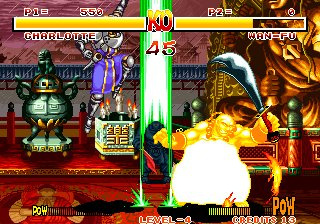 Sequels and more good fighting games are coming for Neo Geo. This one's definately much MUUUUCH better than Art of Fighting, World Heroes or Fatal Fury. i am crazy for the americas arrival!...im nuts...grrr,thank you. This is a really good game, however, the sequel is even more better. I'm anxious for it to arrive it here in the states. I do have to say, though, if it's not uncensored, or if it doesn't at least have an option to turn on the red blood or have a code for that, then I'm not spending my points on it. Then I would have to wait for them to redeem themselves with the Samurai Spirits/Shodown Anthology that is coming out for both the Wii & PS2. This isn't the 90's anymore; it's 2007, going on 2008. It will be the same as the U.S. NeoGeo version, if there's blood in that, then there's blood in the VC version. It won't be edited to include or remove blood. This game is the main reason I still have my Neo Geo Candy MVS Cabinet. I love Samurai Shodown 1 and 2 both. This will be a great addition to the Virtual Console. Now all they need is the Last Blade games to make it REALLY good. >Games with TOO MUCH BLOOD are overexaggerative. 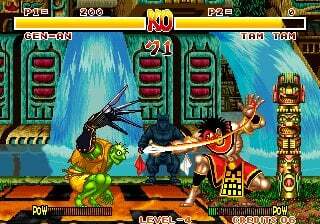 Its too bad, >Samurai Shodown would've be an awesome game. 2/5 from me. >The Last Blade is better in all basic fighting game aspects BTW. This is one of the best fighting games ever. The graphics, sound and playability are second to none, even today. Samurai showdown 2 is even better, and is probably my favorite fighting game of all time. Does anyone have any idea when this or the anthology package are due to be released? I am surprised this hasn't been released on Virtual Console yet. Ah Ukyo, you ladykilling cheesy bastich...I remember how my friend made a point to specialize in Tam-Tam and me in Hanzou. Such memories, I might just buy it to hear the credits run. Oh wait, I bought the soundtrack at a convention back in the day. ...I think I'd still buy though unless of course the Anthology comes out around the same time. Finally. Downloading it right now. With an Anthology being released, i'm not sure whether to wait for that or get this. This situation is just like Metal Slug, only that anthology is out now. @borb - "Since then I've only played crappy console ports." this is a port isn't it? Yeah, an Anthology is coming along, but I would rather just buy one, and its SS2. Though its really tempting to get this one too if it comes to the States. I've never played the NeoGeo version or the arcade version and have downloaded this. Would I still notice the slowdown? As Bass X0 has stated, can anyone else vouch for the prominence of the lag to new players? 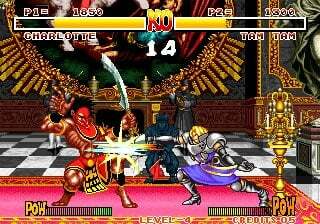 The arcade version is the Neo Geo version (Neo Geo is an arcade unit and a home system with the same arcade specs). I have to see what this lag that y'all speak of. That video seems normal to me. Koresh and Bass, me. I've never played it before the VC and it's atrocious. Take away the Slowdown, and you'd have a really big problem for SFII. But the Slowdown is killing it. Adroitone, that vid isn't of VC footage. I'll be uploading one later to really show it off. I read that the slowdown was present in the original on the Neo Geo, so it's not an emulation issue - not that it changes anything. It looks quite bad in the video (thanks) so I'll probably give it a miss for now and possibly download it when I am bored of my current games. That video seems normal to me. The reason why when you hit someone, or when you get hit, the game seems to stop is because SNK wanted to emphasize the impact. I really should have mentioned this in the original review, but the slowdown (it's actually a 'pause' before a strong attack) is supposed to be there. It's to add emphasis to your strong attacks and give them a little more visual impact. As someone who has spent a vast amount of time with both the arcade and AES versions, I can state that it's in both of those. So it's not an emulation issue or a glitch. It also doesn't impact the gameplay at all, IMO. In fact I think it makes it look a hell of a lot cooler, but this is obviously down to personal taste. and there is blood with strong weapon attacks. maybe it is toned down, I don't know. its not as bad as the review makes it out to be if it has been censored. Thanks for clearing that up Damo, I'll give it a download. I hope the anthology has online cacpability. See, I still like the game and find fun with it. But unfortunately, I'm the only one. My brother hates it. And therefore it's no SFII to me (Beat 'Em Ups require 2 players. It's why I never play the MK series, as I'm the only one who likes MK out of the lot of us I guess they just hate me pwning them with Sub "AWESOME" Zero). I understand that it's supposed to be a pause, but it doesn't do what it's supposed to IMO. Because when you see a huge pause, you expect to be about to deal A LOT of damage IMO, and then you just... Don't. Which is why I hate it as much. Because SFII only pauses when you do a significant blow. Either due to damage or due to just a well timed attack that stops your opponent in his tracks. So it's every minute or so if that. Not every attack. And I believe the guy I like is called Hontau. I also like the Blue Guile looking guy. 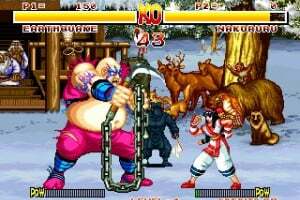 I want to get a Neo Geo game( I played Fatal Fury 1 and 2, samurai showdown and World heros on Genesis) I am going to wait for the SNK classics game and rent it first. Hontau? Do you mean Haohmaru? And 'blue Guile' guy is Galford. Yeah, Galford. I play as the Ryu Hayabusa clone, lol. Hanzo. Yeah. Now I see where you got Hontau from. Yeah, we're still in the early days of the Neo Geo. Last Blade was released years afterwards. We've got a lot of NeoGeo games to get through before we see the really good stuff. I hope we get KoF95 soon and KoF96 before the end of the year. This game is mega hard. Hey the site has updated that all the gore is intact!!!! Is that the USA version only? In the UK one that i have been playing for a while you cannot cut anyone in half anymore like the arcade MVS version. Not a big thing for me but wanted to clear this up? Just how gory is this? Also, does it have multiplay? Most of the games we currently got are from the early days of the system, with the exception of Metal Slug. This game rocks. I owned it for the 3DO back in the day. One of the best fighting games ever, in my opinion. According to Gamespot, it's do to release in Q4 of this year. Plus, there's a video where they talk to the games' developer/publisher so I'm going by them. As far as the gore, I haven't seen anyone split in half either but I did see the blood geyser fatalities. I almost forgot! That Neo Geo collection! Is this game on it? If I'd known about the anthology beforehand I wouldn't have downloaded any of the titles on it for the Neo Geo. How does this compare to King of Fighters '94? Obviously the games aren't much alike, but when I bought KoF '94, it became apparent that I didn't like that style of fighter that much. 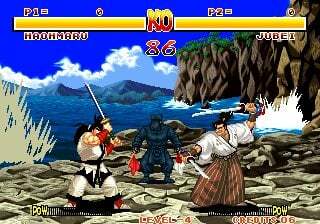 If Samurai Shodown is bounds and leaps above KoF '94, maybe I'll consider it. 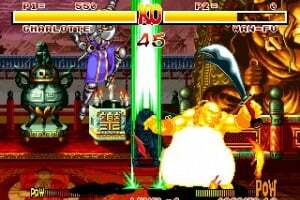 IMO, SS is a much better fighter than KoF'94. Then again, I say this having played SS earlier in life and not being impressed with the 900 pts I spent on KoF'94 here. I'd trade back those 900 Wii points and spent them on SS in a heartbeat. Oh well. Live & learn. I thought I'd take a chance on a game that I'd never played, on a system I'd never owned. Thanks for the reply. How would it compare to more current fighters like Soul Calibur? Quite frankly, it wouldn't be fair to compare SS with SC. The only thing they have in common is that you use weapons. If you're not sure about downloading, just wait until the Anthology comes out. Yeah, you can't compare SS to the Soul series. 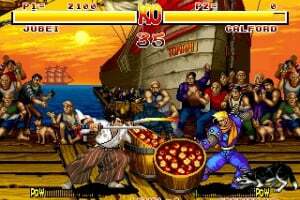 The only 2D fighter that compares to SC is Last Blade. SS is it's own beast. The fatalities y'all thinking of was in SS2, not one, just to let you know. Man, some of you didn't like KoF94 . It reminds me of the old days when you either hated Street Fighter and loved King of Fighters, or vice versa. I hope y'all don't give up on the series though, it gets much much better with every installment (except 2001 and 2002). @Adroitone: Whats wrong with KoF 2002? That was actually one of my favorites. The great thing about KoF series is that everyone seems to have different favorites, many love 96, most love 98 and many like 99, 2000, 2003. The problem I had with 2001 and 2002 was bad art, they simplified it, and bad music. The game wasn't even made by SNK (since they went bankrupt) it was made boy Epoch. Ukyo was my fave... I love this game. This game is break your teeth hard! If only for the limited continues. Has anyone beaten it yet? I was only able to do it once so far. The good news is I've found the perfect control set up for this game (next to a Wii arcade stick) and it involves a Street Fighter controller and a CG to PS2 converter. It is pretty freaking hard (despite what difficulty you put it on). Who do you use morphballer? This game looks pretty interesting, and it's a good thing the blood isn't as bad as I first thought, looking at the video. I personally prefer weapons over fists, so I'd probably like this. I love the style of the game, too. The only problem is I'm a fighting novice, and the difficulty doesn't sound too appealing. Plus there is an Anthology coming out, so I'll probably rent that to see what it's like, and if it's that good I'll probabbly just get the Anthology, rather than download each game. Also, I hope that King of Fighters does get better, because I played '94 in an arcade last week(yes, there is a place that still has King of Fighters '94, and it still only costs a quarter, too), and I gotta say, I didn't have much fun. Maybe it's just because I'm still new at this whole fighting thing, and I still have trouble remembering the moves for each individual character, that of which is amplified in KoF due to having to fight in groups of three. Maybe that game just wasn't good, who knows. I'd just really don't want to give up on that series just yet. I can't wait to personally compare This game to Soul Calibur. I haven't played that one either, but I intend on getting it when I get a Dreamcast soon, as that version is actually better than the XBLA version that just came out. King of Fighters does get better. High points are '96 and '98. Although '97 and '99 are okay too whereas '95 is basically '94 with a team added, a team removed, edit teams and different backgrounds. And to keep this on topic, the official Nintendo magazine here said that Samurai Shodown wasn't worth 900 points because some SNES games look better. 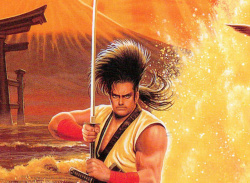 Yeah, but the SNES port is really poor and only SNES games that came out years after NeoGeo Samurai Shodown originally did look better - and even then thats arguable. There's more graphical detail here than in any SNES fighting game. This looks really good! I like the fact that there is some method involved, and that you have to counter and look for openings to win. This is a definite download for me, after I get Ocarina of Time. right ! all uk users .. Can you tell me if this vc port has borders and does anyone know if it's speed - corrected ? Why aren't they giving us full 60hz versions of these games? arrghh - it's vital - especially for the fighters. Definately no button masher, and the artwork is spot on.Love the zoomy-cartoonyness of it all, and the fact that it sounds like he's shouting 'Arse-Quake!!!' instead of 'Earthquake'. I always wanted to own this game, and now i do. Thankyou Nintendo on high!!! That's just poor video quality, the actual game looks much better, just look at the screen shots. This is a must download.